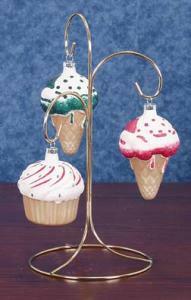 This 3 Branch ornament display tree is available in a brass or silver finish in this money saving set of 4. Various hanging heights create an interesting look for your trio of ornaments! Overall height of each stand measures 10 3/4" with 8 1/2", 7" and 5 1/2" hanging heights. The base measures 5 1/4" in diameter.